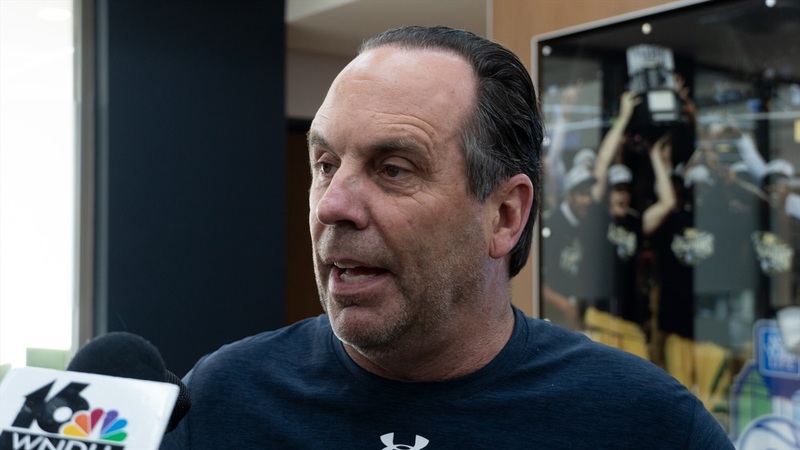 Notre Dame head coach Mike Brey spoke on Thursday afternoon as the Irish prepare to take on Boston College this weekend. “We have a little bit of a problem going and getting a bucket off the dribble when we don’t get anything off our movement. Someone who can just go get a shot. That has been a problem for us. We’ve played two really good defensive teams in the last couple days. “We’ve talked about recruiting a bunch and offseason development. You have to when you’re in the situation we’re in with the goals we have for the guys returning. They are all coming back, so it’s a matter of what do we do in the offseason in development. “One of the things we talked about today was who we felt could make a big jump. A John Mooney jump. Could we have two or three guys make that kind of jump? We’re going to need that. We’re still playing the back nine here and let’s go on the road. “27 minutes is the most he’s ever played. I’d love to get him 20 even though he hasn’t played in a while. He’s been doing a good job with cardio. We had something brewing there with him. Then all of a sudden we got knocked back. “I’d love to find a better offensive rhythm. We’ve struggled with that. We take care of the basketball but can we develop a third scorer? Could a fourth scorer emerge this month? “There’s no question with him and DJ Harvey missing training camp in the summer – they have played a little bit from behind. I think it can help him. We tested him and I was intrigued with him on Sunday. We tested his explosion. He’s good and trending the right way. “But to have a summer of being able to play and work on his game will help him. Down the stretch, I want him to go for it and let it rip. “Sometimes you get on the road and circle the wagons a little more. You’re loose and you can play. The last two games we had a great crowd and all these people there. You almost feel you have the weight of the world on you. I think our young guys felt that at times. “I went right to The Grotto after the Boston College game last time. I sit in our players lounge and there was about nine minutes left on the game clock and I go into the locker room with about eight minutes left. So at nine minutes left, I look to the left and in one of the chairs is TJ Gibbs with his jacket on and hood up barefoot asleep. The door opens and it’s Rex Pflueger coming in on crutches.